"The RV Rental Standard of Excellence"
FIRST TIME RVERS? WE'LL SHOW YOU THE ROPES! BOOK YOUR SUMMER RV VACATION NOW! We frequently provide RVs as dressing rooms for concerts and events. 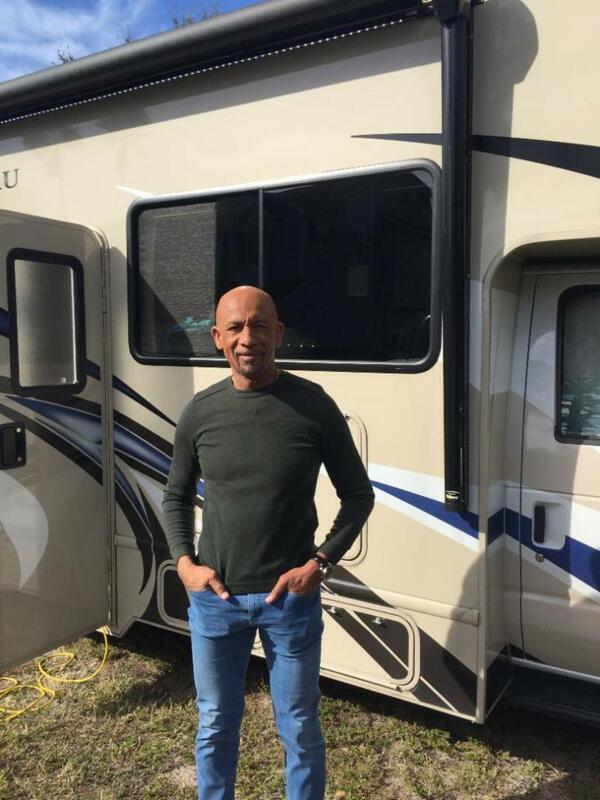 Recently, we provided two RVs for the filming of Montel Williams' Military Makeover in St. Petersburg. Other celebrity guests have included: Bruce Springsteen, Salt 'N Pepa, Flo Rida, Joan Jett, Rachel Platten and many others. Currently, our two Thor Hurricanes are over in Jamaica on the set of Daniel Craig's final James Bond movie. 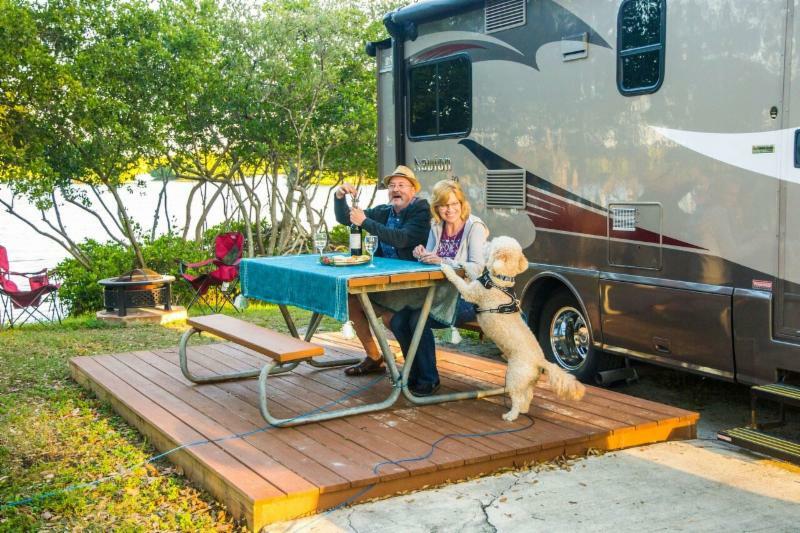 We find that more and more of our guests are enjoying an RV adventure with a Florida Staycation. After all, we do have a plethora of campgrounds, attractions, historic sites and sandy beaches in any direction that you go. The campground offers activities year-round including themed weekends, outdoor movie nights, yoga classes and more. Bike rentals, shuffleboard, sand volleyball and a pool will keep the kids busy while adults can choose to relax in one of two hot tubs. Surrounded by nature yet minutes from museums, restaurants, night life and more, the Madiera Beach KOA, is a little slice of paradise. Click here for further details. It's a star-studded lineup for the Suwannee River Jam, May 1-4. Clint Black, Hank Williams, Jr. and Trace Adkins are just a few that will perform. Spirit of the Suwannee Music Park & Campground (www.musicliveshere.com) is a favorite among our guests, known for its more than 800 acres of shaded camping, incredible festivals plus more activities for the whole family. Visit suwanneeriverjam.com for more info. 10-year anniversary May 15-19. There is a great line up of bands that will keep you on your feet all weekend long. While RV full hook-up sites are already sold out, the festival does offer a lot for those running off the generator. So, give us a call and rent a full self-sufficient RV with all the comforts of home. We can even deliver it for you! Visit orangeblossomjamboree.com for further details. 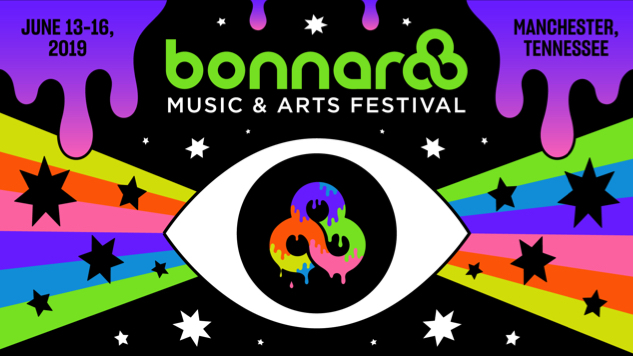 Head to Manchester, Tennessee for Bonnaroo Music & Arts Festival June 13-16 to enjoy more than 150 live acts perform on 10+ stages. The music will be going all weekend long with featured artists to include: Post Malone, Phish, Kasey Musgraves, Hozier, Hippo Campus, Walk the Moon, the Lumineers and many, many others. Camping at Bonnaroo is an experience itself and puts you right in the center of the party. RV spots with 30 and 50 amp electricity are available as well as non-electric sites. Celebrate Independence Day weekend at the "World Center of Racing." Bring your family and set up your RV in the 180-acre infield and enjoy a weekend of racing and patriotism. Pack your grill, portable swimming pool and all of your party favorites and make it a weekend to remember! 2016 Forest River GT3: This is a great 31' Class A gas RV with bunk beds and a drop down bunk over the driver. It sleeps up to 8, offers TVs inside and out and plenty of room for the whole family. 2018 Thor Chateau 23U: A perfect RV for couples, small families and beginners. This no nonsense RV offers all of the versatility and maneuverability plus all of the comforts of home. You can't beat this price! 2018 Thor Chateau 28Z: This 28' Class C has a lot to offer with a queen size in the bedroom, large overhead bunk, TVs inside and out, DVD player and much more. 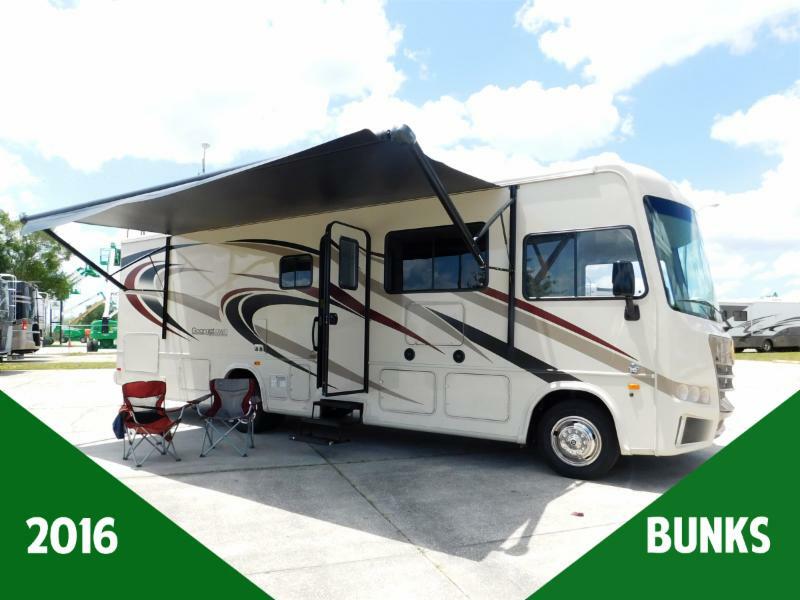 2018 Thor Chateau 30D: This Class C gas RV can sleep 8-10, offers plenty of seating area, bunk beds, TVs inside and out, an automatic awning, gas cooktop and more. A great bang for your buck! 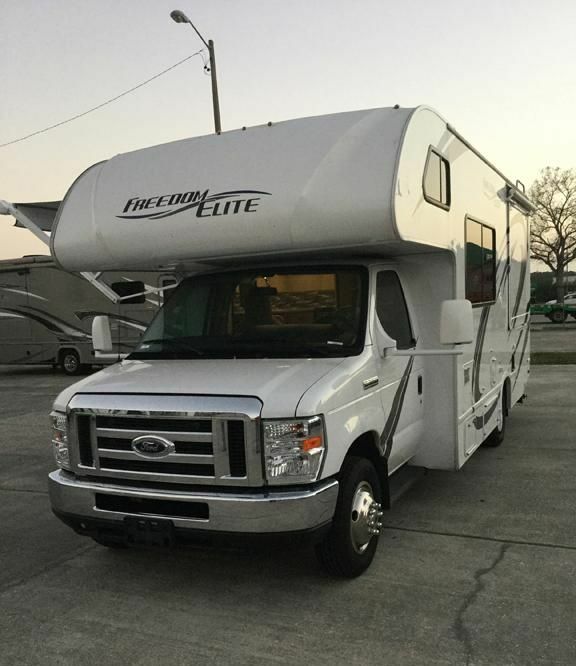 When purchasing an RV from Suncoast RV Rental, you can have peace of mind that these RVs have been professionally maintained by Gator Ford, the largest Ford RV Service Center in the country. Full service reports available upon request. 30-Day Limited Warranty. For further information and photos of our inventory, visit our FOR SALE page. 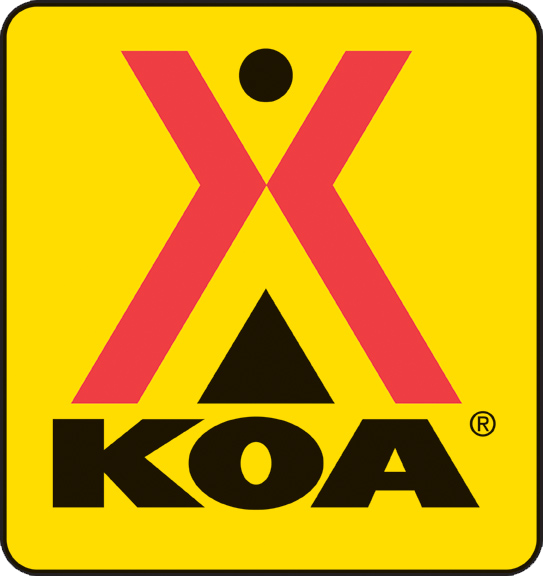 BOOK WITH KOA TO RECEIVE 10% OFF! Stay connected with us on all of our social media site. 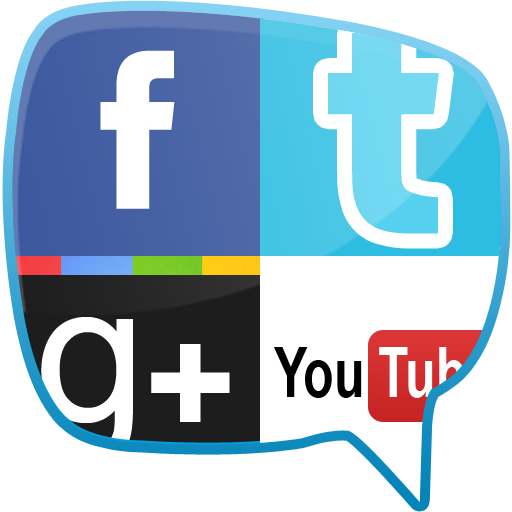 We are always posting tips, videos and trip destinations on Facebook, Twitter, Google + and YouTube. Like us, follow us, or subscribe. We want to hear from you!!! Book one of our diesel RVs for a trip for 7 days or more and get $400 off. At Suncoast RV Rental, we strive to offer our guests the most diverse fleet of late model RVs so they have the freedom to choose an RV that suits their needs. Our Thor Chateau 23U model is a favorite for first-time RV-ers, couples and small families. Our newest RV, the 2018 Thor Freedom Elite 22FE, offers the same versatility and basic layout as the 23U with the addition of a bedroom slide. FIRST TIME RVer? WE'LL SHOW YOU THE ROPES! Travel by RV is the fastest growing method of vacation travel in the US. At Suncoast, we have had thousands of guests in our 14 year history. In addition to rental clients, we also have people who visit our booth at RV Shows who are intimidated by the thought of driving a large vehicle and also do not understand how well-equipped all sizes of RVs are. We have RVs from 22 ft. These 22 and 23 ft. units are just a bit larger than a large pick-up or SUV and they drive just as easy. These smaller units are fully equipped as are the large units with beds, full bath with shower, kitchen with refrigerator, freezer, a microwave and gas stop stoves. They also are all equipped with air conditioning, power brakes and a power transmission. When you rent an RV with Suncoast, you get a full orientation as well as a driving lesson conducted by the owner. This driving lesson consists of about an hour of traveling on 2-way roads, highways and interstates and we will run you through a service station. You might ask why this service station is important. As it has been proven over the years, the most RV accidents happen when the driver pulls away from the refueling pump. When you finish the lesson and orientation, you will be fully equipped to handle the RV. Over the years, we have had drivers from age 25 to 75, both men and women. If you have any challenges during your travel, Suncoast is available to answer your questions 24/7. When you do plan or schedule your trip, we can help you with your proposed trip and map out your route and attractions. We are just a down home family-owned business, come see us. 1. Map out your trip to your destination and pre-book campgrounds when possible. Some days you may just want to 'wing it" but if you are going to a popular tourist destination, it's better to plan ahead as you do not want to be left without a place to stay. 2. Plan for extra time. An RV vacation is intended to be a relaxing adventure. No one wants to spend the whole time driving, so make your schedule a bit flexible and plan for weather, traffic or an impromptu stop at a roadside attraction. You will be thankful and more rested upon your return. 3. Make a menu plan. Traveling by RV saves you money as you can make your own meals instead of eating out three times a day. Remember - you do not have to bring everything with you - there are grocery stores along the way. Pack the essentials and food for a few days. You can stock up along the way. 4. Download a few camping apps to help with planning and travel. There are apps for everything from campgrounds, weather and gas stations to where to find a wi-fi signal or a Red Box location. Some we recommend include: GasBuddy, Allstays Campground, RV Trip Wizard and Waze. 5. Make a budget. 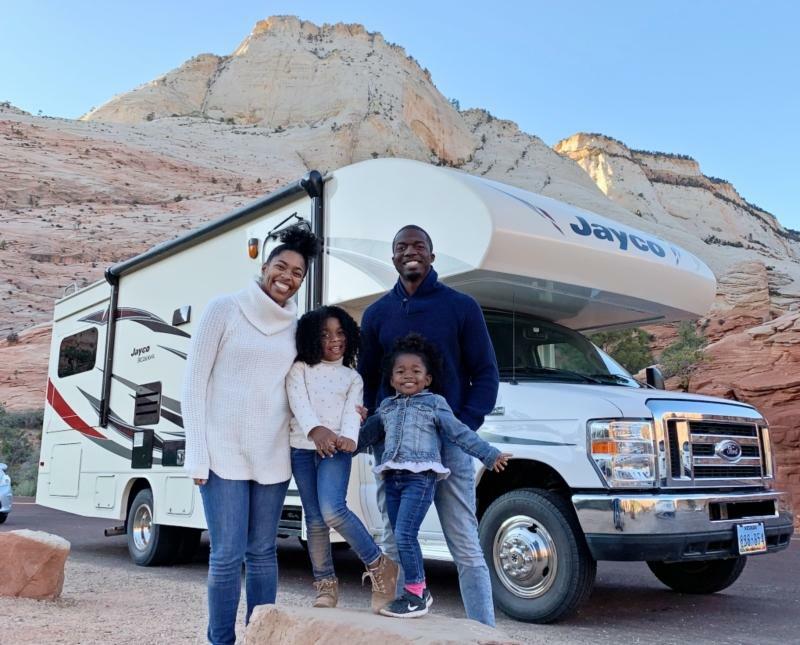 With the RV rental, campgrounds and fuel, things start to add up but with proper planning and packing, you are on your way to saving money on the trip. Plan for gas mileage around 8 miles per gallon. 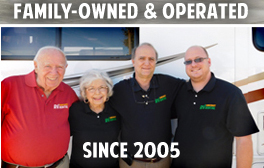 Did you have a great experience with Suncoast RV Rental? Reviews are very important to us. What better way for prospective renters to get a feel for Suncoast RV Rental than to hear it from those who have had the experience? If you would like to leave a review or read all of our google reviews, CLICK HERE. "I'd give them 100 stars if I could. You just don't find service like this anywhere any longer! We were in jam because our RV rental that was booked with RVshare was cancelled last minute because of an inoperable RV. I called Suncoast RV Rental with less than 24 hours' notice. Sharon made the rental a breeze and even delivered the RV on short notice. The RV we rented was a newer unit with low miles and in great shape. From the quick contracting, follow up during and after the trip including a call from the owner, the experience with Suncoast RV was excellent. Suncoast RV Rental is my "go to" for ALL future RV Rentals! "We filmed a Show Called Military Makeover in St. Pete. We used Suncoast Rental for our Host and Crew's RV's. They were fantastic, clean communication, drop off and pickup, which was extremely helpful! Clean, Comfortable and reliable. Would definitely rent from them again! Thanks for everything!" "Nothing but great things to say about Walt, Sharon and the entire team. All true professionals and a pleasure to deal with." "Many thanks to Suncoast RV for providing a beautiful 2018 35 ft RV on short notice. A previously booked unit from another supplier went down with mechanical issues. Sharon & Wally provided very good service both before & during the rental. Many thanks to Teresa who delivered the RV & got us up & running with a walk through & familiarization. Highly recommended!" "Sharon Still helped us and was amazing. We even had a question about waste removal and she helped us on Christmas Eve. Highly recommend." 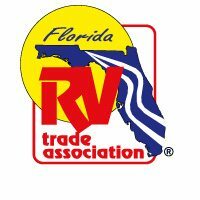 "One of our friends recommended Suncoast RV rental. They made the whole process easy. They even followed up with us to make sure everything was good after our first day. We had a brand new RV, which was great. It was our first time renting a RV, whole family enjoyed it! Everything worked perfectly in the RV. Now, I will be recommending Suncoast RV rental to all my friends and family. Thank you so much!!" "Absolutely the best experience for which we could have asked. The RV was spotless, and everything worked as promised. Our entire deal was based on a handshake and we never felt like we needed to question integrity. Thank you for everything you all are top notch!!"